Well, that was an interesting first round. I do it every year, it's my list of the winners and losers. Already this post season seems chocked full of them. Opening wins from the underdogs: In the Eastern Conference everyone of the lower seeds beat their higher seed foes. In the West, only top seeds Phoenix and Vancouver got off on the right foot. It made for an interesting start. Jaroslav Halak: Halak played and outstanding series against the Capitals. He stopped 41 shots in game seven, another 53 shots in game six as the Habs come from behind to beat the Capitals in round one. Phoenix Coyotes: Even though they had home ice advantage, the Coyotes were clearly the underdog in their series against Detroit. But they stretched it to seven games before they totally lost in the final one by a score of 6-1. Give the 'Yotes credit for playing a great season, and following it up with some good playoff performances. That was gutsy season for a team struggling to stay in Glendale AZ. Jacques Martin: The head coach of the Montreal Canadiens had a plan and stuck with it. And he finally wins a game seven. He played the system best suited to beat the Capitals, and it worked. Get the early goal and shut 'em down. He had some help form a great goaltender, but in the end he finally gets a game seven win. Sidney Crosby: I hate to say it, but Crosby single handily did away with the Ottawa Senators. Talk about a leader, he lead by example with some key goals and great assists to keep Ottawa from every really having a chance. 1 through 8: Every seed is represented in the second round. 1. San Jose, 2. Chicago, 3. Vancouver, 4. Pittsburgh, 5. Detroit, 6. Boston, 7. Philadelphia and 8. Montreal. Zdeno Chara: He started the series with a cage, but he would end it leading his bruised and battered team past the Sabres for the series win. Not sure how long he can lead his team on, but he did everything to help his team win, getting into a scrum and scoring key goals. Washington Capitals Offense: Where did it go? To lose by such a low score is not normal for the Capitals and it was the main reason for their first round loss. Alex Ovechkin, Nick Backstrom were held scoreless in the last games. Mike Green, Tomas Fleischmann and others didn't even get a goal. Buffalo Sabres: They just couldn't over come Zdeno Chara and Tuuka Rask. They were a bit beat up and Ryan Miller played spectacular in net. But the Sabres are upset by Boston proving a great goaltender only gets you so far. NHL Officiating: 5 minute or longer reviews, bad calls that decide game sevens, and overall consistency. It has been a bad first round for the boys in the black and white stripes. And all the Commish has to say is, "Well human error is part of it." Hmm. Versus: Blocking every game in the post season by scheduling them, even if they are not full games. Those with Center Ice were forced to watch partial games because of Versus trying to satisfy every one's needs. The NHL really needs to either open up the blocked games, or find several channels to carry the games through the first round. Hello, NHL network? Bruce Boudreau: Now 1-5 in series clinching games, Boudreau played on his hunches a bit too much in the series against the Canadiens. Making changes too late in the series did not help his team in the end. His authorship of the power play was abysmal. Even with the extra man with over a minute left in game seven, the Caps could not produce a power play goal. A record franchise season in wins, road wins, points, number one overall seed in the league and President Trophy winners. But it all ended in seven games. The Washington Capitals could not figure out Jaroslav Halak or the Montreal Canadiens' defensive trap. All the Habs needed was the first goal of the game, and it paid off for them as they do away with the Washington Capitals in seven games with a 2-1 win. Shock, would be one word to describe it. That the one thing that would bring the Caps' season to a screeching halt is the lack of offense. The Capitals could only muster a single goal in the waning moments of the game off of Brooks Laich stick. That was all they could do, and it wasn't good enough. During the season, if I had told you the Capitals were down by a goal or two going into the third many Caps fans would not even bat an eye to say that they were out of the game. But early goals by the Canandiens in three straight games put them on the ropes. A rare sight for a team that had no problem scoring goals. The Habs got lucky too. Jaroslav Halak played probably the best three games a goaltender can put together in the post season. Credit his defense too, for clearing out the space in front of him and giving him a chance to see the puck. When everyone said that the Caps' size was an advantage, I doubt they envisioned the Habs doing what they did defensively. Or what the Caps lack to do offensively. Twenty four seconds into the third period, the Capitals thought they had tied the game up off of a great shot by Alex Ovechkin. But NHL official Brian Watson waved off the goal, deeming Mike Knuble was in the crease and interfered with Halak. But the replay showed if Knuble interfered, it was by the narrowest of margins. Instead of that, the Habs come back later in the period and score the eventual game winner. The Caps lose another series after taking a commanding lead. In the history of the Caps' post season, blowing a series lead is nothing new. But this one stung, with what the Capitals have done all season long. Questions now arise in the off season for the Capitals too. What new faces will be here in the fall? Nick Backstrom will have to negotiate a contract. Veteran goaltender Jose Theodore will most likely not get a contract renewal in the off season. Non-playoff performers like Tomas Fleischmann and others may find themselves in different sweaters come September. And will Bruce Boudreau be back? All questions to be answered in due time. Washington Capitals' star players are finally hitting a stride. Alex Ovechkin and Mike Knuble scored a pair of goals as the top line with Nick Backstrom accounted for 8 points tonight against the Montreal Canadiens. They would take a three games to one lead over the Habs as they take over the game in the third period and take the game 6-3. Ovechkin started the scoring on the power play. The Caps' power play had been stifled up until game four. Nick Backstrom carried the puck up the ice and found Ovechkin on the wing as the Canadiens' defenders backed away from the oncoming Capitals. Ovi snapped it past Montreal's netminder Carey Price. The Habs would answer back just over a minute later as Mike Cammalleri put away a centering pass up over Semyon Varlamov. Then Montreal would really take over the game in the second period. The Capitals seemed to lose their cool a bit, taking some bad penalties off of some bad discipline. They took three pealties in the second allowing the Habs to build some momentum. Semyon Varlamov made some spectacular saves including three glove saves on what looked to be sure goals. Varly would weather the Habs' storm only allowing a power play goal in the second period. It happed on the second penalty of the second period by the Capitals, Jason Chimera was called for roughing after a Canadien took a swipe at Varly. Andrei Markov shot it from the point, but missed the net. The puck bounced back into the crease behind Varlamov and Brian Gionta stuck his stick in and tapped it into the net. Bell Centre erupted and the Canadiens had the Capitals on their heels out shooting the Caps 21 to 9 in the second frame. Ovechkin did draw a Hal Gill holding call close to a minute later, but the Caps would be guilty of a too many men penalty after some miscommunication on the bench. It looked like the Caps wasted another opportunity to get back into the game. That was until the Habs let up in the last seconds of the period. Boyd Gordon took a clearing pass from John Carlson with Roman Hamrlik pinched in and took himself out of the play. Gordon broke into the Habs' zone with Knuble on the wing creating a 2 on 1. Gordon waited out Josh Georges, who sprawled out to block the pass, and he sent a saucer pass over Georges stick onto Knuble's. Price had no chance as Knuble buried the shot and all the momentum the Canadiens built crashed with a little over six seconds left in the middle frame. The Caps seemed to come out with some jump in the third and it would be Ovechkin once again who would find the back of the net to give the Caps the lead. Less than a minute later Jason Chimera would score to make the hole a bit deeper for the Habs. Add two empty netters by Mike Knuble and Backstrom to round out the scoring for the Caps. Both goaltenders started the series as back-ups, but they took center stage in this on. Varlamov out played Price, coming up with the saves his team needed. Varly showed flashes of his performance in last year's playoff run making some great saves. He would stop 36 Canadiens' shots. The Capitals will take a commanding 3 games to one lead over Montreal by winning three straight games. They have the chance to clinch the series and move to the second round back at the Verizon Center Friday night. Since their disappointing start in game one, the top line of Knuble, Backstrom and Ovechkin have been on fire. Backstrom has nine points (5 goals, 4 assists), Ovechkin has 8 points (4 goals, 4 assists) and Knuble 5 points (2 goals, 3 assists). Alex Semin finally made the scoresheet with a single assist, his first and only point of the series thus far. Semin has been trying to fight his scoring funk. He has 20 shots on net in the series but has yet to score. The Caps again dominate in the third period. The Caps have 80 shots in the final period to the Canadiens' 35. Montreal's goaltender Carey Price was not very sportsmanlike in the waning moments of the game. On the Jason Chimera goal he was tagged with an unsportsmanlike penalty when he chipped the puck at Jeff Schultz as the Caps celebrated. Then when Nick Backstrom scored his empty netter, he gave him a two handed swipe of the stick from the bench. He would be tagged with a double minor for unsportsmanlike for that tap to the Caps's forwards legs. "It's just frustration," Price told reporters following the game. "It's not a good move. But let them know you're there. I didn't mean to actually hit him, but it's over." 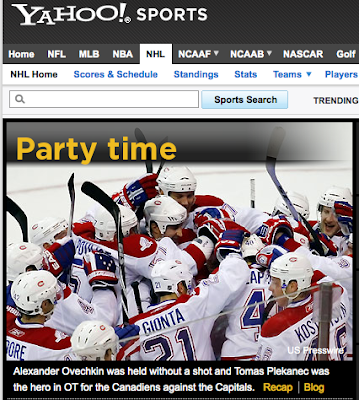 As seen above on the TSN.ca website with the headline that reads No-Vechkin. Kinda harsh, but a little bit true as Alex Ovechkin was held at bay in Game 1. "Party Time." Really? 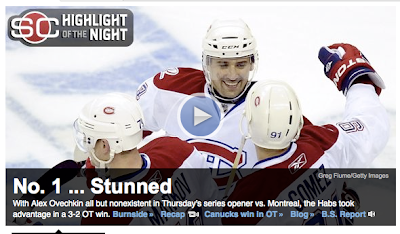 It's not like Montreal won the series. It's game 1. It's like the Capitals can't even move because they are so "Stunned." "Canadiens beat Caps 3-2 in overtime" - Montreal Gazette ... with the first paragraph reading: "Anyone who wrote the Canadiens off in their first-round playoff series against the Washington Capitals is guilty of premature resignation." "We were giving them so many chances and so many shots in the first period. In the second and third our guys started skating." - Jaroslav Halak, who stopped 18 of 19 shots in the opening 20 minutes. The Western Conference wasn't as much of a log jam as they use to be in seasons past. In fact the West was decided pretty early, with about 3 or 4 games left in the season. Not bad. From the previous year's conference winner that looked all but out of it pre-Olympic break to a team that surprised everyone owned by the league, the West is definitely wild. Everyone thought the Avalanche were going now where this season. They lost Joe Sakic to retirement and the team basically blew up their roster going with youth with a few vets sprinkled in. Bottom line, they really were not suppose to do much this year. But Craig Anderson and rookie Matt Duchene made this team competitive and the Avs are sitting pretty in the playoffs. The Sharks will have a pretty motivated, feisty team on their hands. San Jose defeats Colorado in 6 games. A Central Division showdown, the Preds made a run in what may be the toughest division to play in. Led by Patric Hornqvist, the Predators just fell two points shy in the standings of best Detroit for the first time in their franchise's history. They draw a tough opponent in Chicago, who are hungry for more after making it to the Western Conference Finals and fell to the Red Wings. If the Blackhawks get some consistent goaltending, Nashville shouldn't be a problem. Chicago defeats Nashville in 5 games. The Canucks are riding a heck of a season led by Art Ross Trophy winner Henrik Sedin. With gold medal winner Roberto Luongo in net, they look to be on paper a shoe in against a younger, less experienced team. But don't count out the Kings. They have a 24-14-3 record just on the road, while the Canucks have only managed 19 wins away from home. If Ryan Kesler plays like he did during the Olympics and the Kings fall into a slump or have injuries, Vancouver shouldn't have a problem. But I think they have a problem. Los Angeles upsets Vancouver in 7 games. For a team that doesn't have an owner, the Coyotes are showing some gumption this season. They nearly made a successful run in their division by besting the Sharks, but they couldn't keep up with San Jose and instead settled on 4th in the Conference. Ilya Bryzgalov has been their savior in net for the 'Yotes and they made some important moves at the trade deadline to help with some injuries. They, however, drew a tough first round against Detroit. The Red Wings have been on a tear since the Olympic break. Two upsets in a row, wow. Detroit upsets Phoenix in 6 games. I don't see the Sharks having much of a problem with the Kings. But stranger things have happened. Joe Thornton will be trying to shake the playoff monkey from his back and try to help the Sharks move along. Getting some good goaltending in Evgeni Nabokov doesn't hurt either. The Kings will have to rely on a lot of inexperienced players like goaltender Jonathan Quick to help them move to the next round. But the Sharks are just too talented for them. Last year's Western Conference Final is this year's Semi-Final. The Hawks are a much more experienced team this time around and the Red Wings will have to lean pretty hard on rookie goaltender Jimmy Howard. It should be a wide open, high scoring affair between the two. If the Blackhawks don't get the consistent goaltending they need, they will be ending the post season prematurely. Chicago defeats Detroit in 7 games. Now this is a series to watch. The Sharks and Blackhawks will have to do with some pretty hefty travel in this series. Patrick Kane and Jonathan Toews against Thornton, Patrick Marleau and Danny Heatley. The names make it sound more like an All-Star game rather than a Western Final. The Blackhawks need to rely on their speed and scoring strengths, while the Sharks come in the bigger team and need to take up some space from the Hawks. Goaltending will be key again for both teams. Chicago upsets San Jose in 6 games for the Western Conference crown. Two young teams going head to head and there is already drama between the two. Alex Ovechkin's little push from behind that sent Brian Campbell into the boards should be enough motivation for these two teams to be on less than civil terms. And with the Stanley Cup on the line as well. If you want scoring, you got it. Both teams can play a wide open, shoot-0ut style game. So defense will be key. If Campbell returns to the line up by then, he will be the Hawks rally cry. For the Capitals, they will have to depend on Tom Poti and Mike Green on the back end to keep the high powered Hawk offense at bay. Their goaltending will have to be spectacular for them to down an original six team and their franchise's first Stanley Cup. It all comes down to home ice advantage. Washington defeats Chicago in 7 games for the Stanley Cup. Okay, I know what you are thinking, "He is a blogger for the Capitals, of course he is going to pick them all the way!" Well, your right in some respects. I think the two best teams should meet in the finals, and right now those two teams happen to be Chicago and Washington, in my opinion. For the Capitals, a lot of things have to go their way. They need the best out of Jose Theodore to make it to the Finals and they need goal support for their top line. If they can get both, they shouldn't have a problem getting to the Finals (as long as they don't play down to their competition in the early going). I really like the Hawks coming out of the west. They surprised everyone last year by getting to the finals, but I don't think that was a fluke. They post some size and grit in their line up and if Cristobal Huet or Antti Niemi can get hot down the stretch, I don't see why they can't overcome the West. If anything, I don't want to see another Pittsburgh/Detroit final. Nor really do other fans out side of Pittsburgh and Detroit. This predicted final would boost the NHL's image as the two have a history from the regular season and both are in good markets. The Washington Capitals finished an amazing season winning the President's Trophy and the race for eighth was a bit riveting with a near miss by the New York Rangers who lost their playoff spot by a shoot out. It makes panning out the Eastern Conference no easy chore. But I will try anyway. There will be a more comprehensive breakdown of this series hopefully by tomorrow. 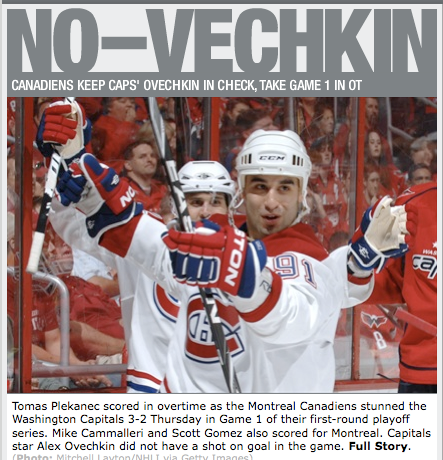 But the long and short of it, Montreal just doesn't have the guns to run an open style of game with the Capitals. Canadien coach Jacques Martin will most likely play a controlled game where one goal will be the deciding factor and bet his team can grind out a defensive transition game to make it close. But the Caps are far to skilled and if the games are going to be decided by a goal or less, the best bet is the Caps score it. Washington defeats Montreal in 5 games. If there was ever going to be an upset in the first round of the playoffs, best bet is it is in this series between the Devils and Flyers. The Flyers played New Jersey surprisingly tough this season, partly because of their size. The Devils don't usually like to get into a physical type game and the Flyers aren't happy unless someone is getting thrown out of a game. It is going to come down to goaltending, and my money is on Martin Brodeur. New Jersey defeats Philadelphia in 7 games. This is actually a tough series to figure out. Buffalo just doesn't score much and Boston is a very defensive team. So it is going to come down to goaltending. Boston's Tuuka Rask is a rookie, but has played strong enough to over take the number one job from veteran Tim Thomas. While in the other net, Ryan Miller has played so well for the Sabres that many are considering him this year's MVP. Rask was 4-1 against the Sabres, while it's hard to ignore Miller's good play. It is literally a coin flip. Injuries also play a pretty big factor as both seem to be limping into this series. Boston defeats Buffalo in 7 games. When are these two not going to square off in the first round of the playoffs. Ottawa was destined for disaster at the beginning of the season, but they found a savior in Brian Elliott. He helped the Senators rise to a playoff spot when most left the team for dead. The Penguins are the returning Stanley Cup Champs, and taking on Ottawa was not what it was like 3 years ago when they lost that emotional series. If the Pens come out sluggish or play to Ottawa's level, the Sens could steal a series away. I doubt if a healthy Evgeni Malkin and their coach Dan Bylsma will let that happen. Pittsburgh defeats Ottawa in 5 games. The Caps offense against the Bruins defense. They should be close games and the Caps will have to deal with a lot of Bruin hard work. If the Capitals can hold their own on the defensive end, it's no contest. The Bruins don't have the offensive power to over match the Caps. Most likely the Bruins will play a tough game keeping the score close to one goal differential as possible, much like the Canadiens did the round before. Washington defeats Boston in 6 games. A divisional matchup with Stanley Cup implications. The Penguins will have to face down a tough defense in the Devils while holding their own on the back end. This is were they will miss a few of their defenesmen gone way of free agency. Marc-Andre Fluery will have to out duel the best if the Pens hope to repeat. The Devils will have to lean heavily on Ilya Kovalchuk to get them to the next step. Pittsburgh upsets New Jersey in 7 games. The road to the Stanley Cup Finals in the Eastern Conference will go through these two teams. Again, the ratings will be huge, the games will by hyped and Alex Ovechkin and Sidney Crosby will not disappoint. But just like the Penguins were determined after they lost to Detroit to not repeat, the Capitals will look for the same. Last post season, this series would eventually decide the Stanley Cup winner. A possible repeat of the same? Washington defeats Pittsburgh in 7 games for the Eastern Conference Crown. Caps move on, at least in theory, to the Stanley Cup Finals. But wait, no fearless prediction can go much further with out a look at the Western Conference first. That will come out this afternoon along with my pick for the Stanley Cup winner. I am so excited, I could just spit. For a game that really did not mean much in the standings there was plenty of fireworks between these two Eastern Conference foes. The Washington Capitals would come up just short and Alex Ovechkin would miss out on any hardware for the regular season as they drop one in a shoot out against the Boston Bruins 4-3. Alex Semin scored to reach 40 goals on the season, a career high for the Caps' forward. Capitals also got goals from Eric Belanger and Mike Knuble. While the Caps had the lead twice (1-0 and 3-2) but some break downs in defense and the Bruins new found confidence in offense were able to match the Caps with some big goals by Micheal Ryder and Marco Strum. The real fireworks came just 2:43 into the game, just twenty seconds after Semin's goal to give the Caps the lead, when Jason Chimera ran Tim Thomas. Thomas returned the favor with a few jabs of his blocker into Chimera's face. The Bruins goaltender would draw a double minor for the punches and Chimera would get a misconduct later when he went back to talk to Thomas about the rest of his blocker that was still in Chimera's face. That seemed to wake Thomas up and the Caps seemed to struggle after that encounter. The Bruins seemed embolden by the incident. The result was a gutsy game by the Bruins and a well earned 2 points won in the shoot out. It was clear the game didn't mean much for the Capitals' head coach Bruce Boudreau. He put Boyd Gordon and Matt Bradley out to take the shots against the Bruins goaltender. Both failed to score, as the Bruins got scores from David Krejci and Miroslav Satan. Ovechkin came up short on both the Rocket Richard Trophy and the Art Ross Trophy as he was shut out from getting a single point or goal. Sidney Crosby and Steven Stamkos would tie for the Rocket and Henrik Sedin will win the Ross. The Capitals finish the marathon season with a franchise record 121 points, the President's Trophy for best regular season record in the league (a franchise first), franchise record road wins at 24 and the first team outside the original six to get 120 points in a season. It was a season of firsts as the Caps finish first in team goals (318), first in the league in wins (54), first in the league on the power play (25.2%, the Caps have never led in the NHL), first in the league in road goals (157), first in power play goals on the road (38), first in team +/- (+74, the closest team in second is Chicago with +46), first in Goals For average of 3.8. The Capitals also found out who they will face the Montreal Canadiens. Preveiw of that match up will come soon. This was a great season by the Washington Capitals. But turning that success into playoff success depends on a great deal for them. If Jose Theodore continues to hold true to form, the Caps would benefit from a tighter defensive crew. There is not much to complain about though, since the goal differential of +85. The Washington Capitals have never had a regular season clean sweep of the Pittsburgh Penguins. They have also never won 24 road games, finished first in the Eastern Conference or won the President's Trophy either. Clearly it is a season of firsts for the Washington Capitals and it shouldn't be surprising that they would be able to keep an Eastern Conference foe and defending Stanley Cup Champions at bay in a 6-3 win at Mellon Arena. Alex Ovechkin broke a four game goal drought to score a pair of goals. He pulls even with Sidney Crosby (who also had a goal tonight) for the Rocket Richard Trophy for most goals at 48. The Caps also got some goal production from some other lines as well as Alex Semin, Tomas Fleischmann, Mike Knuble and Matt Bradley all made the scoresheet. "We got a team that is built as an offensive team," Bruce Boudreau said. "You've got other lines that [besides the top line] can come in. You've got Steckel's line, I thought Beagle's line played good and Flash's line. I mean they all chipped in." It was a physical affair as the Penguins tried to out muscle the Capitals in the first period. John Erskine left the first period with a lower body injury, the Capitals ended up playing with only five defenseman for the last two periods. "Pittsburgh was pretty physical against us," Boudreau said of his defense core taking a beating. "I thought all five [remaining defensemen] came to play." "It's tough when you get down to 5 guys," Tyler Sloan said to reporters, wearing the Caps' hard hat as the players' choice for the game's MVP. "But the group of five back there did a heck of a job, I thought. We just banded together and grind it out." It would be a miss step by Alex Goligoski who stumbled with Semin bearing down on him to get the Caps going. Semin took the open ice and waited out Penguins' goaltender Marc-Andre Fluery before top shelfing it over the netminder's left shoulder for his 39th goal of the season. The Capitals got an early jump in the second period when Mike Knuble shot a harmless looking slapper towards Fluery. The shot had eyes as it squeezed under Fluery's right goal pad and giving the Caps the 2-0 lead. The Penguins fought to get back into the game and would eventually draw a penalty out of Knuble who was sent to the box for holding. Crosby took advantage of Dave Steckel floating high to cover Sergei Gonchar and skated into the open ice and shooting it past Semyon Varlamov to get the Pens on the board. The Capitals would respond just 21 seconds later when Semin beat out an icing call centering the puck off the half boards to Fleischmann. Semin would take an elbow to the side of the head from Maxim Talbot in the process. Flash took the pass and shot it over Fluery's right shoulder to give the Caps the two goal lead back. That goal would end the night for Fluery. Brent Johnson would come in relief. The Pens were not finished there. Jordan Leopold took advantage of Caps' defenseman Shaone Morrisonn for a pair of goals. The first was a point shot where Mo lost his stick and tried to block the shot with his skate. The result was the puck deflecting in on Varly and through his pads into the net. "When you see a lot of bodies in front sometimes you look for sticks and skates what ever it may be," Leopold said of his deflection goal. "That is how I ended up scoring my first one and I was looking for that again." But the Caps scored again to regain their two goal lead. Bradley would score his 10th of the season with two minutes left in the second period as he deflected a Quintin Laing shot past Johnson. "It's not a big milestone," Bradley said with a smirk. "But it felt good to get to ten and get a big win." Leopold wasn't done with Morrisonn, early in the third Leopold lined up a shot on net. Morrisonn may have screened his goaltender going down for the block and the puck sailed past Varly. The Penguins would pull into one goal for the third time in the game. "We were trying to get the momentum back," Penguins' coach Dan Bylsma said. "When we did ... numerous times tonight [the Caps] were able to come back and get a goal immediately, in that type of fashion. And we kept having to restart." "We fought back a couple of times," Crosby said. "They took that momentum away pretty quick." The Penguins took their first and only penalty of the game not long after clawing back into the game. Bill Guerin got his stick a bit high on Morrisonn, knocking the defender's lid off. It would only take Alex Ovechkin 4 seconds to score on the ensuing power play. Right off the draw, Ovechkin took in the loose puck and buried it past Johnson's left arm. "I had a few chances to score [in the last few games] but it didn't go in," Ovechkin said of his recent scoring drought. "Finally it goes in and I feel pretty good." Ovechkin would complete the series series sweep with an empty net goal that drew him even with Crosby for most goals in a season. While the Caps have swept the regular season series, the Caps know the playoffs are a different story and they may be back here again. "It's nice to win all our games [against Pittsburgh] in the regular season," Bradley said. "But the regular season doesn't mean anything when it comes to playoffs. And everyone knows that they are a playoff team." "It was a tough one to lose," Crosby opined after the game. "I thought we did a lot of good things and any little space they had they made it count." The Caps will finish their road campaign with a 24-10-7 record. No team in the NHL can match Washington's 10 road regulation loss record for the '09-'10 season. Ovechkin pulled up into a tie with Henrik Sedin for points, but Sedin had an assist in their game against Colorado. The Penguins loss drops them down to fourth in the Eastern Conference as the New Jersey Devils won their game tonight against Atlanta. The Capitals' top line got some much needed goal support with goals from the second and fourth lines. Besides a few miscues by the Caps defense, the Penguins were stifled on the offensive side. Special teams was also a bright spot as the Penguins were 1 for 4 power play chances spending 6:46 with the extra man. In contrast the Caps were 1 for 1 on the power play and only had 4 seconds of extra man time. Just before the game, Capitals recalled Jay Beagle and Karl Alzner. Beagle had a good game filling in for Eric Belanger who was one of the banged up players Boudreau sat. Beagle was the best Capital in the face off dot winning 7 of ten draws (70%). Alzner did not play. Mike Green was sat for a second game in a row to "rest." The Capitals may choose to rest more players in the last two games of the season. This may be the last time the Capitals will play in Mellon Arena. They finish up their stay at the "Igloo" with a regular season record of 34-51-7-1 and 8-16 in the playoffs. I highly doubt it will be the last time these two meet at Mellon, but it would be nice if was the last time. Jose Theodore didn't get a lot of help after the Capitals jumped out to an early lead. But the Columbus Blue Jackets were a goal shy of a come back and the Caps earn an historic franchise record breaking 51st win and 23rd win on the road as they down the Jackets 3-2. It started out well enough for the Caps, Alex Semin opened the scoring with a dazzling slap shot to beat the Blue Jacket goaltender Mathieu Garon. A Jacket defender stumbled allowing Semin the time to tee up the slapper that found room under Garon's arm and in the back of the net. It was Semin's 38th goal of the season. The Caps would take advantage of some bad penalties by the Jackets and even though they didn't score on the power play, they did score just as Derick Brassard stepped out of the penalty box. Eric Fehr dug the puck out of the corner to Mike Knuble who chip passed it to an open Tomas Fleischmann who found the back of the net. That goal would mark the end of Garon for the Jackets who surrendered 2 goals on just 4 shots. Steve Mason would take over from there, but the Jackets would once again take a couple of bad penalties giving the Caps a 5 on 3. This time the Caps would make good with the two man advantage as Mike Green scored his 19th of the season and set a career best in points at 74 points. Green would keep in the dump and pound the slap shot past Mason. The Caps looked as if they were going to cruise against a non-playoff team, but the Blue Jackets would make special teams a wash as they scored shorthanded. After that the Caps played more on their heels rather than a team that made scoring 3 goals against the Blue Jackets an easy thing. Antoine Vermette's short handed goal, assisted by Rick Nash, would spark the Blue Jackets as they out shot the Capitals in the last two periods 27-16. In steps Theodore, who made two great saves early in the second period to keep the Blue Jackets at bay. Theo looked calm and poised in net making some solid saves when the Caps defense were making mistake after mistake. The Jackets made things interesting scoring after Tom Poti and Tyler Sloan both chased Nash behind the net, leaving the slot open. Nash found Vermette for their second set up of the game. The goal gave the Jackets confidence and they nearly scored on the following shift. Bruce Boudreau called a time out to calm his troops down. After that the Jackets found it hard to get shots in on Theodore. It is a record winning game for the Caps, but they are still struggling scoring when they want to or playing sore defense allowing a team to stay in it. Alex Ovechkin continues struggle scoring goals. He had a few chances to get pucks on net, but he missed the net completely or had his shots blocked. He remains a goal behind Sidney Crosby for scoring lead and 3 points behind Henrik Sedin for points lead. The Capitals will come home to face the Bruins, a team that is a possible first round match-up against the Caps. Then they will head to Pittsburgh to face the Penguins on the following night. Both games will be broadcasted on Versus. WASHINGTON, D.C. – Hershey Bears forwards Keith Aucoin, Alexandre Giroux and Andrew Gordon have been named to the American Hockey League (AHL) All-Star Teams, as voted by AHL coaches, players and media in each of the league’s 29 member cities, the AHL announced today. Aucoin and Giroux were named to the first team – both for the second year in a row – while Gordon was named to the second team. Aucoin, Giroux and Gordon have all appeared in games for the Capitals at some point this season. Aucoin (oh-KOIN), 31, established a career high with his 100th point of the season Wednesday night. The Waltham, Mass., native, who signed a two-year contract last month that will keep him in the Washington organization through the 2011-12 season, leads the AHL in points and assists and ranks fourth in goals. This is the fourth appearance on an AHL All-Star Team for Aucoin, the highest scoring American-born player in AHL history. Giroux (jhi-ROO), 28, last season’s AHL scoring champion and most valuable player, leads the league in goals with 44 after scoring twice Wednesday against Syracuse. He scored his 300th career AHL goal on Sunday and has scored 104 goals in the last two seasons with six games remaining in 2009-10. He is currently second in the AHL in scoring with 97 points. Gordon, 24, has been named to the league’s all-star team for the first time. Washington’s seventh-round choice, 197th overall, in the 2004 Entry Draft, is currently third in the league in goals with 36. He is also tied for the league lead in power play goals (18). The Hershey Bears have been creating havoc on the history books as the team sails to new heights (and probably another Calder Trophy [knock on wood]). Brooks Laich makes his return tonight for the Capitals against the Atlanta Thrashers. Caps still are dealing with the injury bug for others though, John Carlson (upper body), Quintin Laing (lower body), Boyd Gordon (back injury), Scott Walker (knee) and Brendan Morrison (groin) are out.